All-you-can-eat meals are what we all live for, but they always seem to burn a hole in our pockets. Not anymore. Now you can enjoy these unlimited buffets at under INR 500 – an absolute steal. Think delicious authentic Bengali food and buffetsm and the name that comes to mind is 6BP. The buffet lunches start at INR 485 plus tax on weekdays from 12:30pm to 3:30pm. The spread is traditional Bengali like something you would get in a Bengali household – rice, luchi, moong daal, aloo dom and the more elaborate fish, prawn, chicken and mutton preparations. Save space for dessert as they have over four options. A rather new addition to the Camac Street area (in the same building as the Shisha Bar Stock Exchange), they have lipsmacking Indian food. Head there to fill up on a variety of fish, chicken and mutton gravies, smoky kebabs, pulao and biryani and of course, desserts like rabri, jalebi and more. All this at at just INR 499 plus taxes on weekdays. The veg buffet costs the same and has different varieties of paneer, dal and vegetable koftas. The Wall is a popular Chinese joint so getting a cheap buffet here is a real steal deal. Have a sumptuous Chinese layout for only INR 399 plus taxes on weekdays and INR 475 plus taxes on weekends. 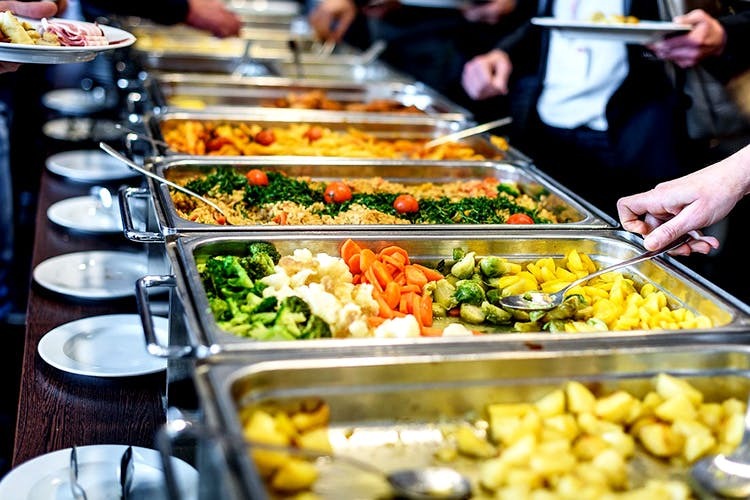 The buffets are only for lunch and consist of a soup, 4 starters (2 veg and 2 non veg), egg fried rice, veg noodles, 4 side dishes( 2 veg and 2 non-veg) and three types of desserts. Other than being famous for its cocktail bar, Chapter 2 at Kankurgachhi has introduced a Chinese buffet menu for just INR 499 plus taxes (weekday lunch). Extra broke this month? Then this is the place for you – they serve the cheapest buffet in town for INR 249 plus taxes, only. The main course rice and noodles dishes are veg and you can have a maximum of two varieties of each course, but it’s still quite a deal. Great place to give that pending treat of yours to the eagerly waiting bunch of colleagues or friends.